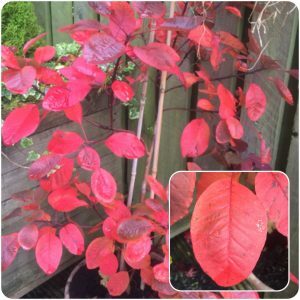 Autumn is a wonderful time of year to appreciate the changing colours of the trees and shrubs in your garden, and also especially the colours around the town and surrounding countryside. As the air temperature becomes noticeably cooler, and the amount of daylight decreases, trees and shrubs respond and the chlorophyll within the leaf begins to reduce (chlorophyll is a chemical within the leaf that gives the leaf its green colour in spring and summer). As the chlorophyll reduces and the green colour fades the orange and yellow pigments in the leaves become more noticeable. Other chemical changes also occur in leaves and we are often also gifted with a range of reds and purples. It really is a wonder of nature and we get to see this amazing spectacle every autumn. When we look out at the garden from the kitchen window, or on a walk in the woods, or even just a walk through the local area at this time of year, we are bound to see an array of colour. We love it. Unfortunately we don’t really get to enjoy all this wonderful display of colour completely for free. Somebody somewhere is sweeping up the leaves to ensure our streets and pathways don’t become too slippy, and to ensure our drains and water courses don’t become blocked and lead to flooding when it rains. 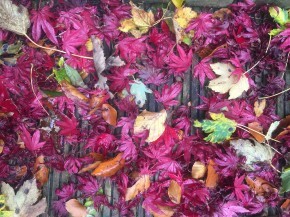 Even in our own gardens we might begin to notice piles of leaves gathering at the corners of the house, garage or shed. At some point, after we have enjoyed the colours a little, it’s time to get out there and have a little tidy up. This is best done when it’s not too windy otherwise you might be chasing leaves around your garden for quite a while. It might also be a good time to involve and introduce your children or grandchildren to a spot of gardening. 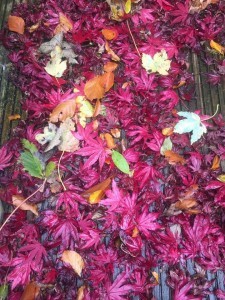 Leaf clearing and collection can be a form of exercise and it’s a great way to get out of the house for some fresh air. For kids, and for some adults too, it can also be great fun. You could turn your leaf clearing and collection into a game or a piece of art. 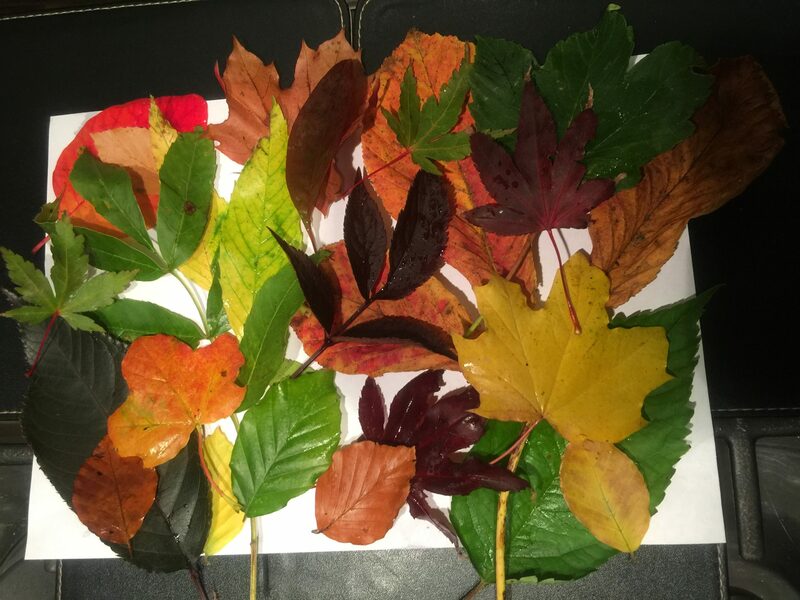 Collect as many colours of leaf as you can and stick them onto a piece of paper, or press them between the pages of a scrap book and take a photo to remind you of this wonderful time of year. This way you can collect leaves and memories at the same time. Some people put the leaves they have collected into a compost heap or into black bags in order to make leaf mould out of the decaying leaves (leaf mould is a nutrient rich form of compost). This leaf mould process does take quite a bit of time though (anything between 6 -18 months, so you’ll need somewhere to keep your bags of decaying leaves. Alternatively, if you have one, you can put your leaves into your household green waste recycling bin to be collected by the Council. Please be assured that the Council do indeed recycle this green waste. It does not go into landfill. It all gets recycled, often by a private contractor, on an industrial scale and is made into compost. One final point to remember about leaf fall is that your lawn will not like or tolerate having clumps or blankets of leaves lying on top of it for any great length of time. The leaves will block out the light and the leaves will eventually begin to decay. The lack of light, and the heat generated in the decaying process, is very likely going to kill the grass underneath the leaves. You will get bare patches and your lawn will look rather unsightly come spring. So every now and then during autumn make sure you pop out to the lawn and pick up the colourful leaves. Try not to walk on your lawn when it’s very wet. Save this job for a drier day. 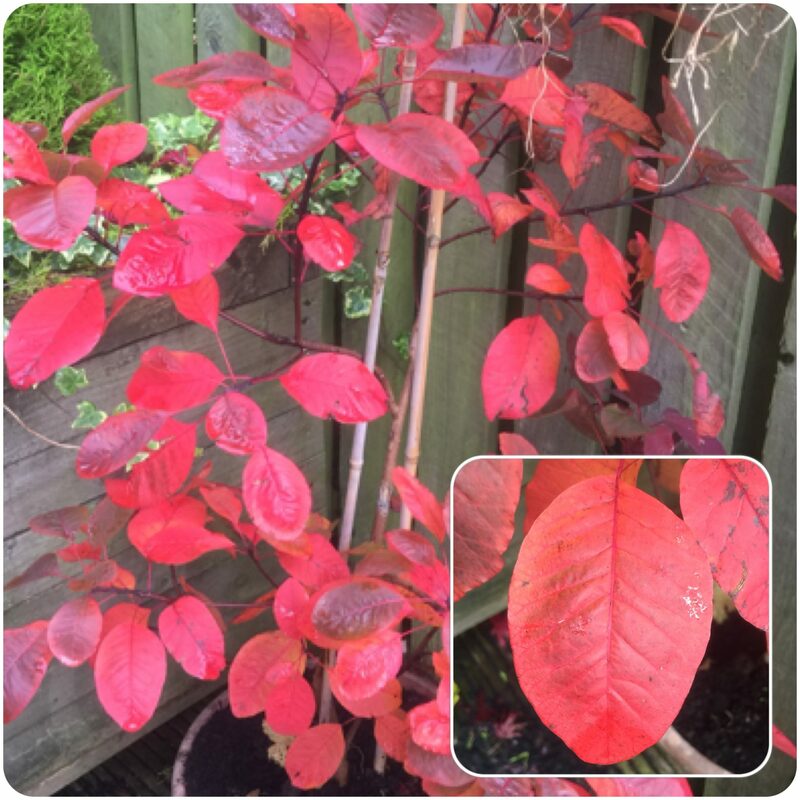 If you are not able to pick up the leaves in your garden, whether that be due to poor health or mobility issues, or work commitments or time constraints, you can always give Mr & Mrs Gardens Limited a call. 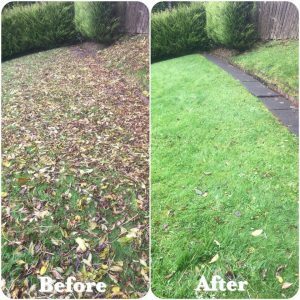 If it’s lawn related you can always rely on The Lawn Advocates (the lawn care side of our business) to provide a range of lawn care services, including leaf collection and leaf clearing. If you have so many leaves that they won’t all fit into your household green waste recycling bin, don’t worry. We ensure all the leaves and green waste we collect and take away are recycled at an Environmental Protection Agency licensed recycling site. Leaves go in, and compost comes out. Enjoy the colourful leaves in your garden and neighbourhood, and have a wonderful autumn.